It was 60 years ago, in June 1950, when America’s war to defeat communism began in Korea. It was two decades later when self-described “communist” Americans — part of the Weather Underground Organization (WUO), actively worked to defeat capitalism to transform America into a socialist state. Two of those Americans, President Obama’s family friends, were William Ayers and his wife Bernadine Dohrn. 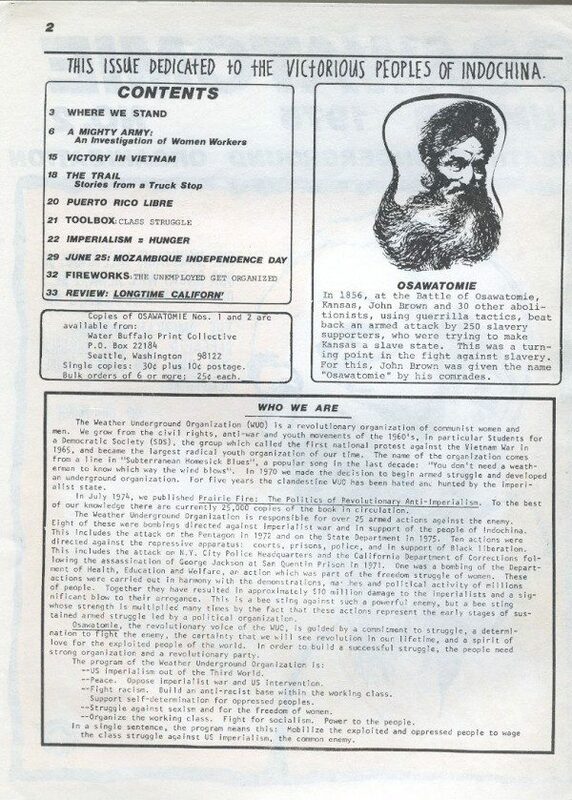 Some insights into their plans and ideology can be seen in Osawatomie, “the revolutionary voice of the WUO,” a 35-page newspaper published by WUO in 1975-1976. Osawatomie is guided by a commitment to struggle, a determination to fight the enemy [in FBI files the enemy is often referred to as Pig Amerika], the certainty that we will see revolution in our lifetime, an a spirit of love for the exploited people of the world. In order to build a successful struggle, the people need strong organization an a revolutionary party. – US Imperialism out of the Third World. -Fight racism. 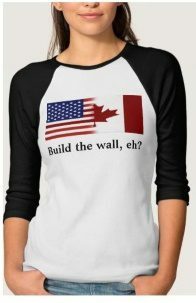 Build-anti racist base within the working class. -Support self-determination for oppressed peoples. -Struggle against sexism and the freedom of women. -Organize the working class. Fight for socialism. Power to the people. The revolutionary struggle of the working class will transform our society — destroy this outmoded and cruel capitalism and build the socialist society that can provide for human need and progress. Under capitalism, the rulers own the wealth and control production, the proletarians survive only by selling their labor. Their interests are fundamentally irreconcilable. Class struggle, at times hidden and then more open, assumes a variety of forms. 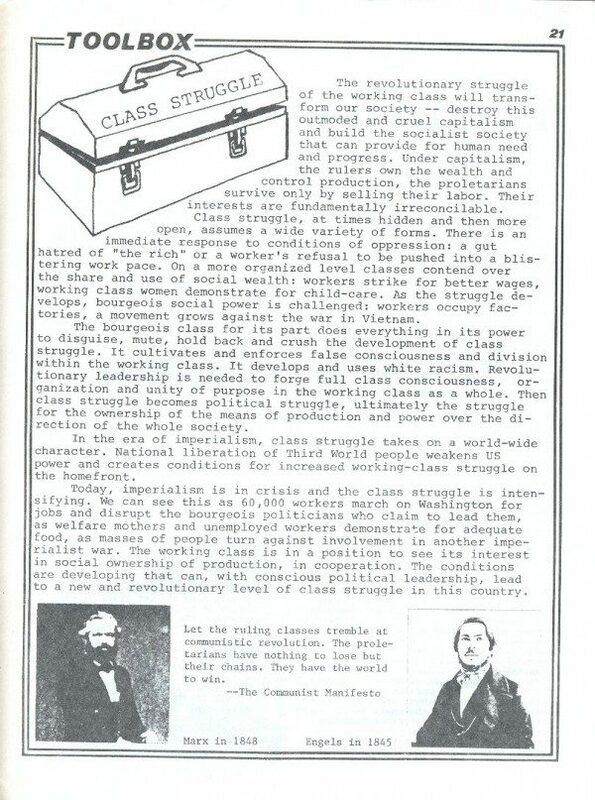 There is an immediate response to conditions of oppression: a gut hatred of “the rich” or worker’s refusal to be pushed into a blistering work pace… On a more organized level classes contend over the share and use of social wealth: workers strike for better wages working class woman demonstrate for child-care…. Let the ruling classes tremble at communist revolution. The proletarians have nothing to lose but their chains. They have the world to win. 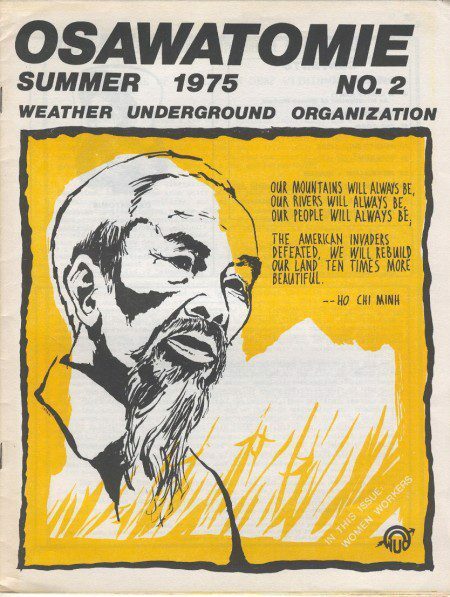 To read the Weather Underground Organization’s Osawatomie, Summer 1975 No. 2 edition, in its entirety click here.